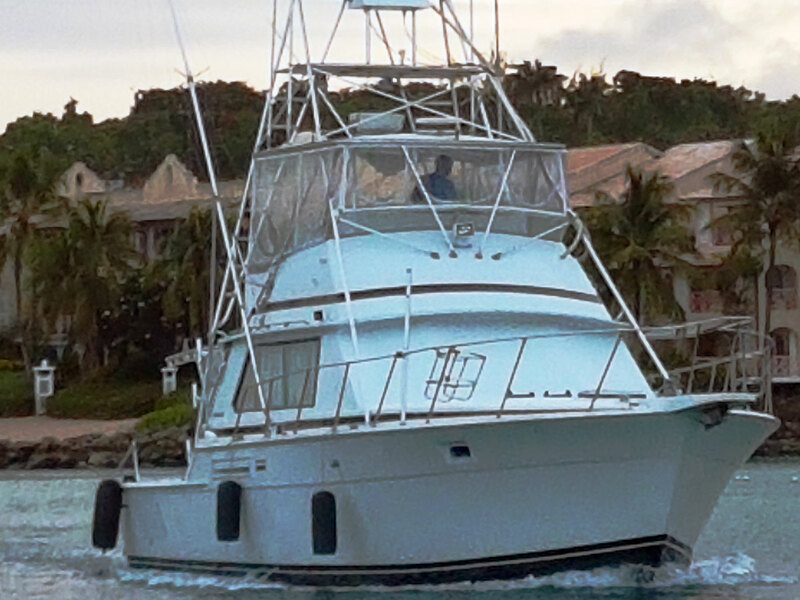 This 42ft Bertram - sport fisher comes equipped with everything you will need for a productive day out on the water. It is powered by twin diesel engines, and can comfortably accommodate six passengers. The vessel is fully air-conditioned and comes outfitted with sounders, radar, fish finder, VHF and EPIRB. The yacht runs at a cruising speed of 24 knots. 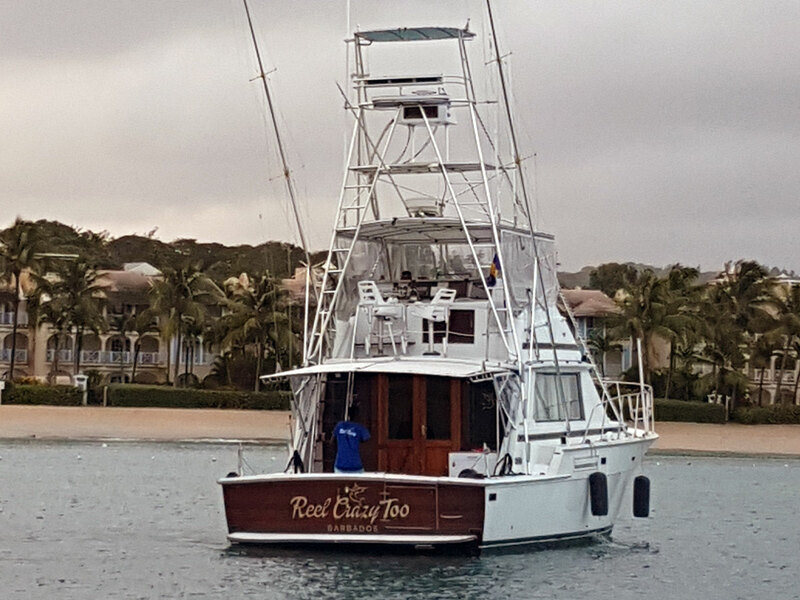 The boat is fully equipped for fishing but also has all the amenities for a regular private day charter like bathroom, kitchen, bedroom, and shower. Those clients who prefer fishing will be happy with a fighting chair, outriggers, downrigger, large flybridge and top of the line Penn and Shimano rod/ reels. 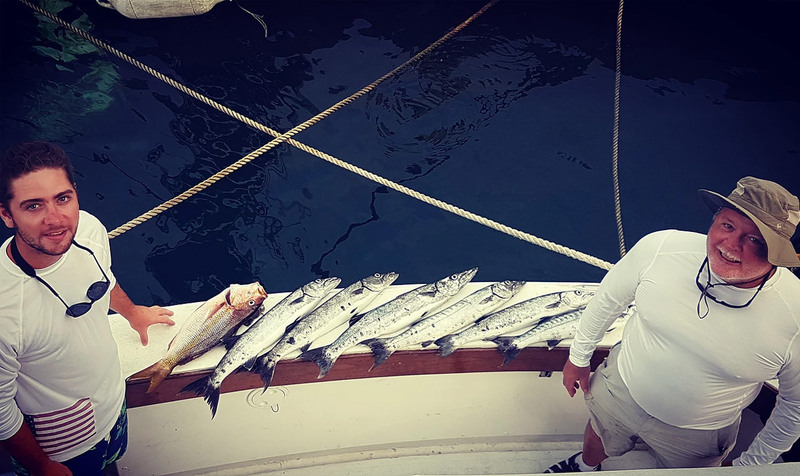 FISHING TRIPS - The crew is skilled in fishing for Wahoo, Barracuda, King Fish, Tuna, Mahi Mahi, Sailfish and Marlin’s and will clean any catch for you to have cooked in one of the local restaurants. REGULAR PRIVATE CHARTER - This boat is also available for regular use charters. Rent this vessel for family days at the beach, snorkeling with the turtles, sunset sails or wedding trips or just to get away of it all in the privacy of your own boat rental. All trips include snacks and drinks on the half day trip, and they add lunch on the full day trip. Spend the afternoon with us snorkeling shipwrecks and swimming with Sea Turtles. Shipwrecks full of fish and corals are in easy depths for you to view them snorkeling. The Sea Turtle Snorkeling trip is the most relaxing way to enjoy your snorkeling experience in shallow waters. 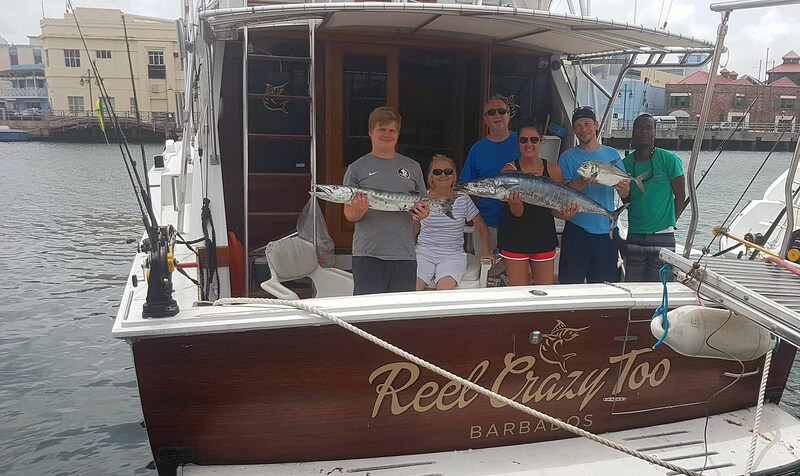 Reel Crazy Charters offers trips designed to show your kids how to fish and have fun fishing at the same time. 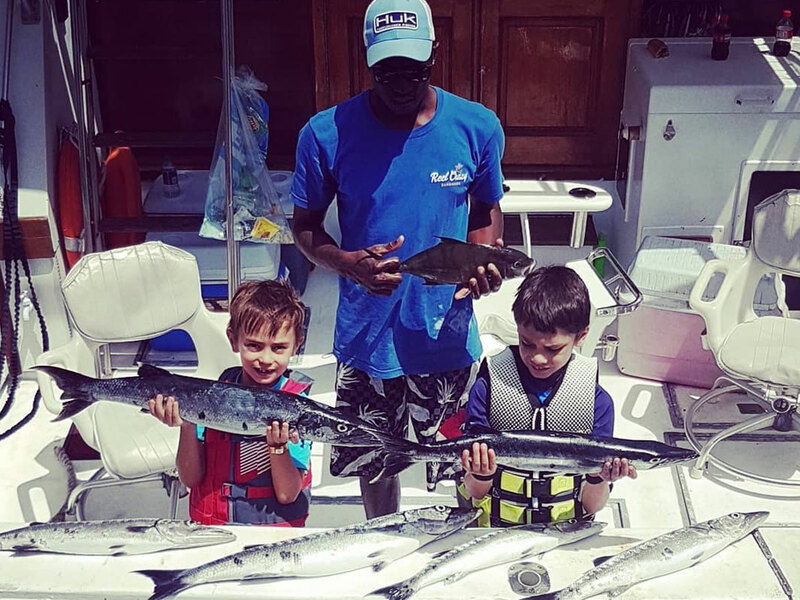 Now you can offer your kids a trip of their dreams, bring them fishing with us for good inshore fishing on the shallow bars for Barracuda, yellowtail, horse-eye jacks or a little deeper for wahoo and bonito. Our trips are safe and friendly for kids of all ages. Watch their expression as they bring in a Barracuda or watch them fight with the super powerful horse-eye jack. We take them on the inshore reefs where you will encounter these species. Choose between 4, 6, 8-hour packages and you could also add snorkeling as well. 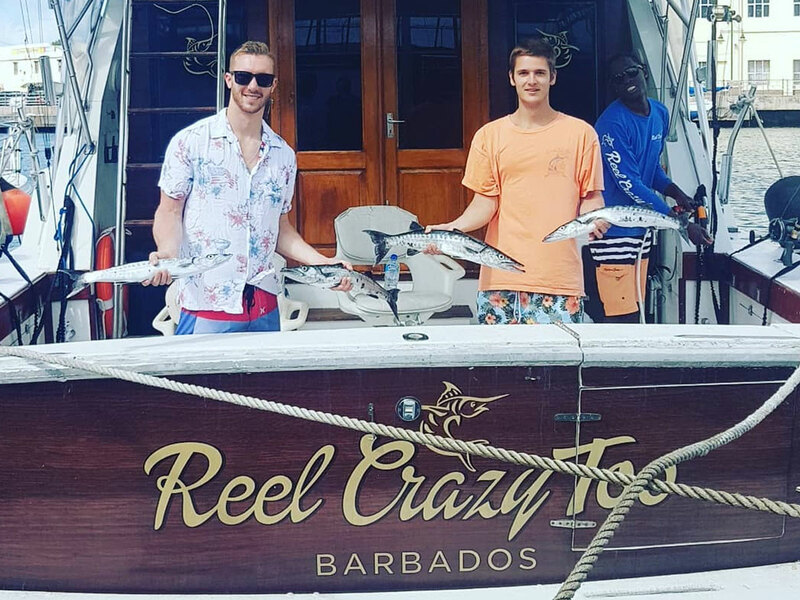 Our 4 Hour fishing charters depart from the dock in Bridgetown and we head out into the fishing areas within 5 minutes. Fish such as Wahoo, Mahi, Tuna, Sailfish, and Barracuda can be caught just 10 min from the dock. We take you hunting for what's catching, Barracudas, mahi or wahoo. When we have enough and you are satisfied we take you into the marine park for snorkeling with sea turtles and on the shipwrecks. 5 Hour trip and 750 USD up to 6 people. 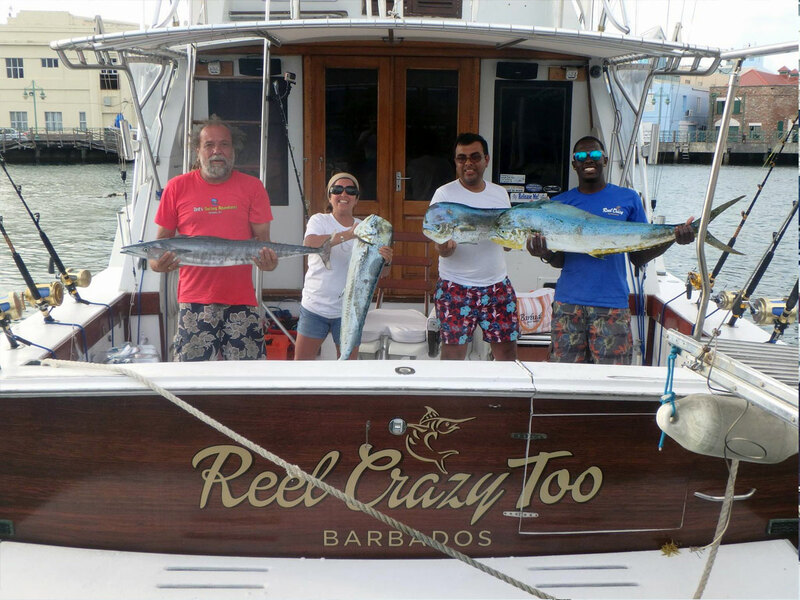 Our 6 Hour fishing charters have a bit more time to hunt Billfish, Wahoo, Tuna and Mahi. Depending on conditions on the day we will guide you to secure that trophy fish you always dreamed of. This trip includes snacks, drinks and sandwiches. Transport provided with in a 2 mile radius of Bridgetown. 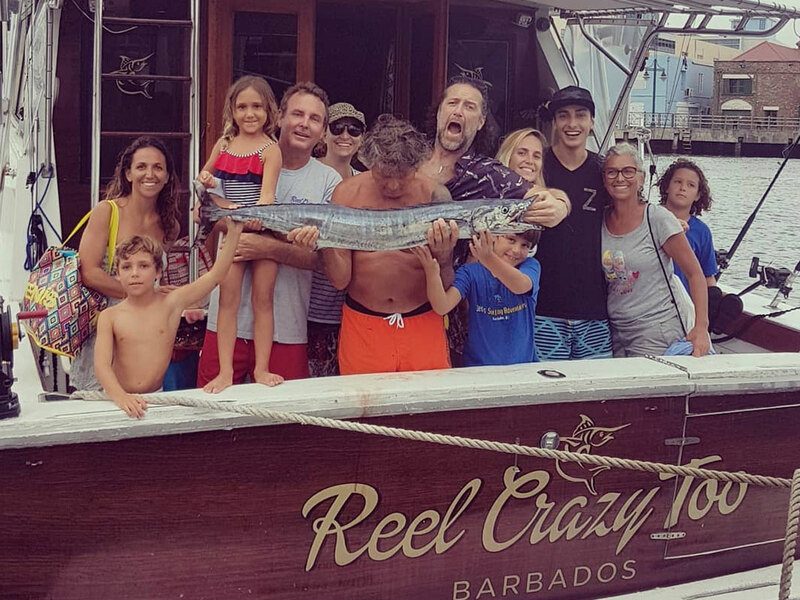 The ultimate day out on the ocean hunting Billfish. Fish in comfort looking to bring that dream Blue Marlin boat side. Many other species such as Sailfish, White Marlin, Wahoo, Mahi Mahi and Tuna. Trip Includes Snacks, Drinks, Lunch Sandwiches. Transport to and from your hotel. 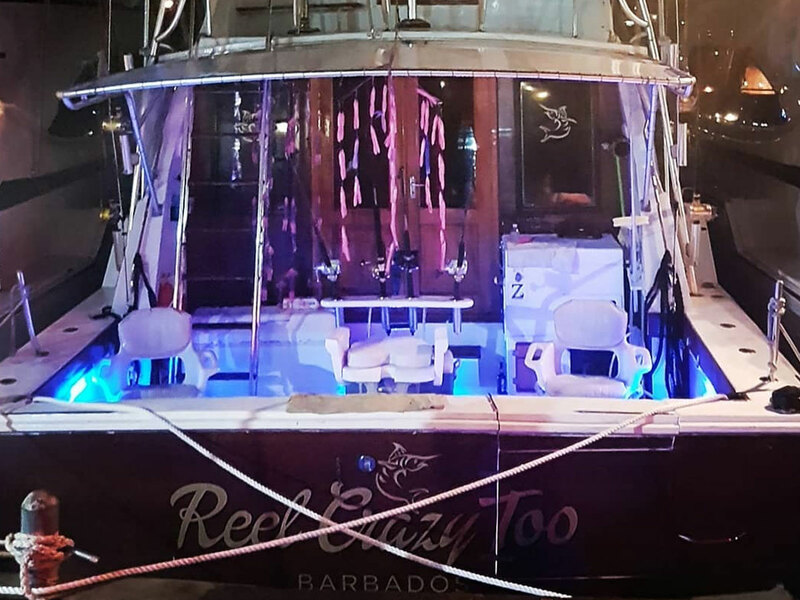 © 2019 Barbados Fishing Charter, all rights reserved.